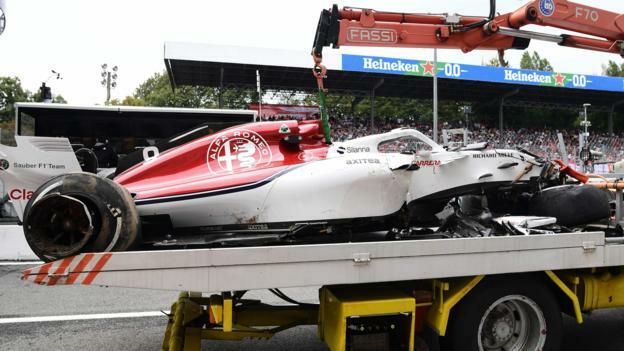 Ferrari’s Sebastian Vettel set the pace in second practice at the Italian Grand Prix despite a high-speed spin. The German, 17 points behind Mercedes’ Lewis Hamilton in the championship, lost control at the famous Parabolica corner at the end of an impressive run. Hamilton was third fastest, behind Ferrari’s Kimi Raikkonen and 0.287 seconds slower than Vettel. There was a huge accident for Sauber’s Marcus Ericsson, who somersaulted several times at the first chicane. Vettel’s advantage over Hamilton suggested that Mercedes are again on the back foot. If that form continues, Mercedes will be concerned, because they already expect to struggle at the next race in Singapore in two weeks’ time. On Friday, Hamilton was fighting a lone fight against the Ferraris – his team-mate Valtteri Bottas was nearly 0.7secs off the pace and just over 0.4secs off the Briton.